On Solid Ground - Wisconsin Campgrounds in the News - Bud Styer & Associates, LLC. AT Smokey Hollow Campground in Lodi, Wis., a typical weekend goes something like this: Families splash around in the man-made "swimming pond" — a lined, sand-bottomed swim zone filled with outsized inflatable toys. Staffers in blue or white T-shirts deliver pizza to tents, RVs and air-conditioned cabins scattered across the grounds. Kids line up for face painting, temporary tattoos, Segway riding clinics and amusement-style rides while parents sip coffee and surf the Web on laptops outside the General Store, where they can also buy firewood for the requisite campfire and hot dog roast. "Never a dull moment," said Kathy Kranz, an office manager from Chicago, who spent this past Memorial Day weekend at the campground with nine other family members, including her 15-year-old son, Jimmy, and her 17-year-old daughter, Krystal. At some campgrounds, said Ms. Kranz, who owns a 34-foot motor home with another family, there is "absolutely nothing to do, except if you want to go fishing." But with all the amenities at Smokey Hollow, her family "just had a ball," she said. "There were so many things to do." Getting close to nature and telling ghost stories around a fire are no longer the main attraction at many campgrounds. In an effort to attract families — and charge more — private campgrounds across the country have been reinventing themselves from sleepy, rustic campsites to bustling "camp resorts." You can still pitch your own tent, but with food delivery, you don't have to slave over an open flame for dinner. "It's Disneyland for campers," said Jim Rogers, the chief executive of Kampgrounds of America, one of the country's oldest operators of private campgrounds, which has been adding free Wi-Fi, espresso bars and air-conditioned cabins to some of KOA's 450 parks. Mr. Rogers likens the evolution of campgrounds in recent years to the amenity creep in the hotel business. Just as hotels have added free cocktail hours, fluffy beds and spas to attract clients and get them to stay longer, he said, campgrounds too have been "ratcheting up the value" with new features and services. 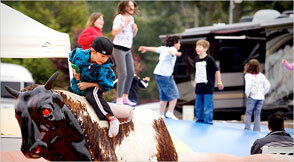 The Santa Cruz/Monterey Bay KOA in La Selva Beach, Calif., is the home of an espresso bar, but also has miniature-train rides, outdoor movies, a mechanical bull and a giant outdoor Jumping Pillow (sort of a cross between a trampoline and a bouncy castle). In Kimball, Mich., the Port Huron KOA features an in-line skating rink, batting cages, bumper boats, an ice cream parlor and seven playgrounds. And Yogi Bear's Jellystone Park in North Java, N.Y., just added a 16,000-square-foot water playground with water slides, water cannons and other spray features to its long list of kid-oriented attractions. Not unlike hotels, which offer different room types at different prices, private campgrounds have been expanding their lodging options. The Santa Cruz/Monterey Bay KOA, where tent sites cost about $60 a night, has RV sites (from $75), 50 air-conditioned cabins (from $115) and 13 lodges that can sleep six and have a small kitchen, dining area, bathroom and central air and heat (from $225). In April, the campground added six Airstream trailers that sleep a family of four for $150 a night. Also like hotels, KOA introduced its Value Kard Rewards program, last year, allowing repeat campers to earn points redeemable for savings on their next visit. "We're campers in name only at this point," said Bob Mills, a retired firefighter from Stockton, Calif., who parks his 30-foot trailer stocked with, as he puts it, "every luxury known to man" at the Santa Cruz/Monterey Bay KOA for a few weeks each summer to spend time with his daughters, Lisa, 15, and Julie, 12. After rolling out of their bunks each morning, Lisa and Julie may take a ride on the motorized Fun Train, race around on three-wheeled recumbent bikes or hit the heated swimming pool with friends. In the evening, they'll meet up with Dad for dinner — pizza delivered straight to their campsite — and the requisite campfire with s'mores, before turning into their comfy bunk beds inside the trailer. All of this may elicit a swift roll of the eyes from hard-core campers, used to pitching a tent deep in the woods and relying purely on nature for entertainment. But the "camping lite" travelers offer no apologies. "I like to camp two hours a day," said Scott Crompton, owner of Yogi Bear's Jellystone in North Java. "Then I retreat into my motor home with every amenity there is." His staff caters to campers like him with a roster of activities, food delivery, people who will park your RV for you and a fleet of golf carts campers can rent for $50 a day to cruise around the 100-acre park. "Certainly nobody is rubbing two sticks together to make their own fire," he said. The recent surge in amenities at private campgrounds partly grew out of the rise of the RV business, as ownership grew by 15 percent from 2001 to 2005, with more than eight million households owning a recreational vehicle. As droves of baby boomers snapped up increasingly fancy motor homes over the previous decade, they sought out campsites that could not only handle the increasing need for electricity and water these vehicles required but that also matched the plush interiors of their RVs. Campgrounds soon found out that the more amenities and services they provided, the more they could charge. "The objective is to maximize dollars," said Bud Styer, a camping consultant who owns and manages several RV parks and campsites in Wisconsin, including Smokey Hollow. "If I have 100 sites and I'm charging $10 a night, that's $1,000. If I add an amenity, I can charge $15 more a night. The return on investment is staggering." The campsites at Smokey Hollow cost about $45 a night on average and include access to the swimming pond and other water features. Campers can pay an extra $25 a person for a V.I.P. wristband for unlimited weekend use of the miniature golf course, pedal carts, the Jumping Pillow and other amenities. But even at these rates, a weekend of camping can still be more affordable than staying at a hotel or motel — especially if you cook your own food — a point the industry expects to bank on during the recession. So far this year, Mr. Styer said, business is up about 12 percent across his four campgrounds. "When the economy gets a little rough, camping usually gets better," he said.